Mom is a really good cook but I bet you already guessed that by the way she gushes on about food every week. She is often in the kitchen which is why I like spending time in there. I’m not actually in the kitchen so much as at the edge of the kitchen. I have a special spot that I sit atop; a little orange carpet square. There are a few reasons for this. I am less likely to get stepped on (like Buddy does), I am less likely to piss Mom off and thus am more often fed treats. I also have a better vantage point from there than I would if I were just under foot all the time (being under foot some of the time does have benefits though, when strategically timed). Sometimes, I don’t even bother getting off the back of the couch, my perch as it were. It is not because I’m lazy but rather because I like to see how often I can get Mom to come over to the couch to feed me. She is very hospitable and it makes me feel special when she goes out of her way to cross the room for my discerning opinion (I like to feel special, and doted upon, don’t you?). I figured out long ago that she likes to feed us and we don’t even have to exert much energy to get her to do so. There is a particular pillow in the corner of the couch that I have, over many years, molded to my form perfectly. It gets fluffed all the time but I keep putting it back to the way I like. From there, I have established my seniority over Buddy and am also able to survey my domaine, inside and out. I like to think of it as my throne. My pal from across the street calls me Princess, so I must be royalty. Then again, he is always in awe that I get to eat better salmon than he does. It suits. Some nights we spend less time in the kitchen than most. On the simple nights, Mom is tired. She starts out more slowly and I come down off the back of the couch to cuddle next to her. She instinctively begins rubbing my back and I repay her by putting my head on her lap and letting out a deep, full-chested, straight from the diaphragm sigh. This lets her know that I am completely relaxed and content. I like doing that because I can hear her smile and feel her body release some of it’s tension. There has been a lot of energy in the kitchen lately which does come and go in spurts. The house has been very aromatic and heavy with meat (which I have happily helped eat). Recently though the odor from the oven became so intense that I felt like taking myself out for a brisk walk. They won’t let me go by myself – I have been known to do that and cause great distress. Instead, Daddy asks to go with and if I just stand there, he just leaves the back door open a bit to let me breathe in some fresh air. Perhaps the oven needs cleaned because it smells burnt. I saw Mom take a charred piece of foil from way in the back. She burnt the top of her hand again as she reached in to retrieve it thinking that would make the smell go away. The burnt essence is still present though when the oven gets turned on high. Humans have such a poor sense of smell and somehow this dangerous odor has alluded them. It is up to me to act unusual and pretend that I am going to run away so that they understand that the oven needs cleaned. With this type of charade, I am helping to keep us all safe. Thursday was one of those simple nights. The kitchen remained quiet until late into the evening. I guess that makes sense since they didn’t come home until just after seven, even though Buddy and I were waiting patiently by the end of the couch, starring at the door every time we saw headlights flash by. I knew I would like dinner that night when they walked in the door. I could see a small, neatly wrapped package in Mom’s hand that I knew came from the fish market. I could also smell salmon. I am particularity fond of salmon. It is what I request every year on my birthday just like Mom used to request lamb for hers. It wasn’t my birthday but I got salmon that night and more time in Mom’s lap than on my little orange square. Buddy and I always get our salmon wrapped in foil and cooked for 5 minutes in the oven which leaves it tender and moist. Mom puts seasoning on hers and Daddy’s and cooks it in the metal pan that gets really hot from the flames underneath. Scary. I could lick butter off the floor when it pops out of the pan but she doesn’t like that so I let Buddy get in trouble instead. The only thing that got heated was the fish. The rest were raw sliced veggie’s which I only got a few bites of because they were the type that Daddy thinks makes me poot. The purple stuff is good (I like veggies that are crunchy) but that white stuff, while crunchy, was weird, so I spit it out and let Buddy think I was giving him a treat. This is more of a process than a recipe. Winter salmon is smaller than summer salmon but don’t let that fool you, it is super tasty! Put the cabbage and those celery root shavings (I’m not so crazy about personally) in a bowl and squeeze in the lemon juice, toss in the seasonings and drizzle in the olive oil. Rub it all together and let it sit by itself until the salmon is cooked. Always pat out the water from the fish (Mom says this makes it turn brown which she and especially Daddy think is good). Using your paws er, fingers, take a pinch of salt out of the salt drawer (I can’t reach) and sprinkle it over the fish. Mom moves her thumb back and forth as she waves her hand up and down the length of the fish. Next, grind some black flakes from the steel tube that makes noise as it grinds. Sprinkle the sweet sugar over just like the salt, only less. Mom says you won’t taste the sugar but that it also helps make it browny. One of her friends told her she was weird to do this but then told her it tasted good. I like mine better plain but I never turn down bites from their plate when they offer. Put the metal pan over the flame and then add some oil. Right before the fish goes on top of the oil, throw in a pad of butter (if it starts to bubble and smoke, turn down the flame and make sure the noisy, sucky thing is on overhead). Add the salmon and let it sit still, untouched, which is tricky. You should hover over it though (like Mom does). Sometimes I begin to bark randomly; she starts talking back so I keep barking. It’s kind of fun. Buddy starts pacing back and forth, licking the floor. Mom never seems too amused. After the salmon has sat for a few minutes without moving, Mom says it is brown so she turns it over. A minute later she takes the pan off the heat and moves the fish to a flat tin plate (that she uses for little pizza too), puts it into the oven (which must be about 375 degrees based on the smell). A few minutes later, it is pulled out of the oven and the fish is put over a mound of the veggie’s that have been divided onto each plate. Put a lemon wedge on top so that it can be squeezed over with as much or as little of the tart juice that you want. While their dinner cooks, ours is cooling. We get to eat first so we can help with their plates. This is my kind of dinner, more lap time, less begging, plus two meals. Patient and loyal wins the game. To demonstrate my agility, flexibility and MacGyver-like traits, I am using my (now somewhat thickish) black bean soup for garnishing brunch before putting the rest in the freezer (perhaps never to be seen again, for awhile anyways) and that, I promise, will be the last you will hear, from me, about black beans and soup (for at least a fortnight). Brunch, to me, is basically anything served between 10 am and 3 pm that contains an egg (on it, in it, or next to it) but only on weekends and holidays, and especially if accompanied by a mimosa or Bloody Mary. This is a slightly odd perspective I realize, partly because brunch should, in theory (at least in the U.S.) be lighter than dinner. 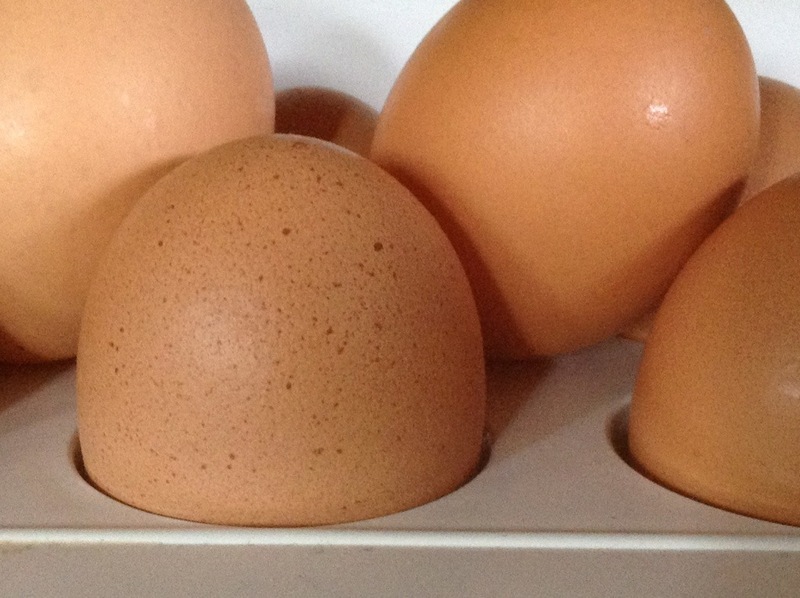 Yet with this egg theory, it is (sometimes) actually adding additional content to an already perfectly well-rounded and substantial meal. Be that as it may, I equate eggs with morning meals, perhaps due to my somewhat traditional, American upbringing, and therefore feel an egg is required at brunch (a combination of breakfast and lunch). To go one further, lunch (or dinner for that matter) actually turns into brunch with the addition of an egg. Regardless of this somewhat skewed reasoning, an egg, a really good, farm-fresh egg, is a lovely partner to many suiters and to this, I will happily adapt. So today (Saturday), it is later than 10am and earlier than 3pm, I am serving what could basically constitute dinner, adding an egg and washing it down with a Bloody Mary, hence, here we have brunch. PUT the zucchini and tomato pieces into a bowl and ADD the rest of the ingredients. MIX TOGETHER and set aside. *I had leftover black bean soup which prompted my idea for this brunch but if you don’t have black bean soup made, you could simply open a can of black beans (or better yet, cook your own), drain and rinse the canned beans and add them to a sauté of chopped onions. To this sauté, add a little chili spice, salt, pepper, cumin and oregano. Douse it all with a little orange juice and cook for a further 10 minutes until the juice has soaked in. Mash the beans with the back of a stirring spoon. Adding a little olive oil or yogurt will help make them be more pliable and will enhance the taste. SEASON the pork with salt and pepper. POUND it between wax paper to help tenderize. 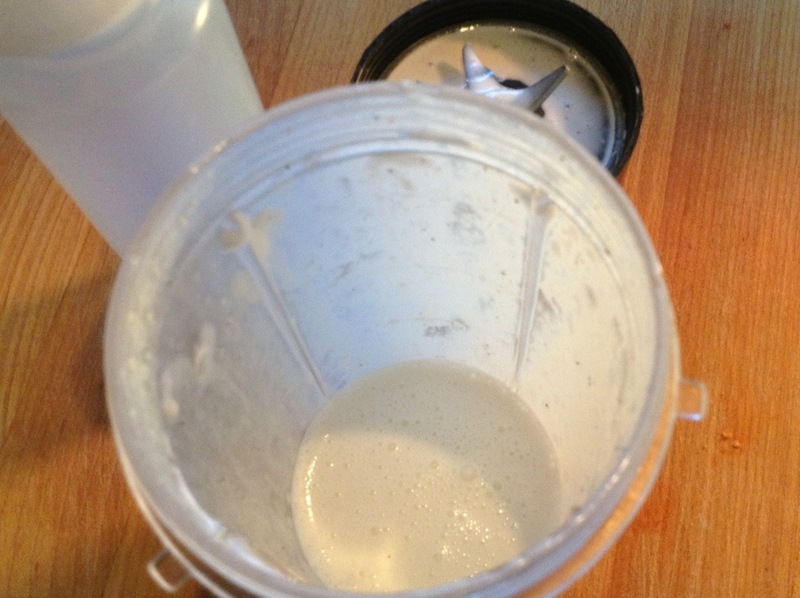 RUB OVER a little plain yogurt; enough to coat and noticeably see white on the pork. 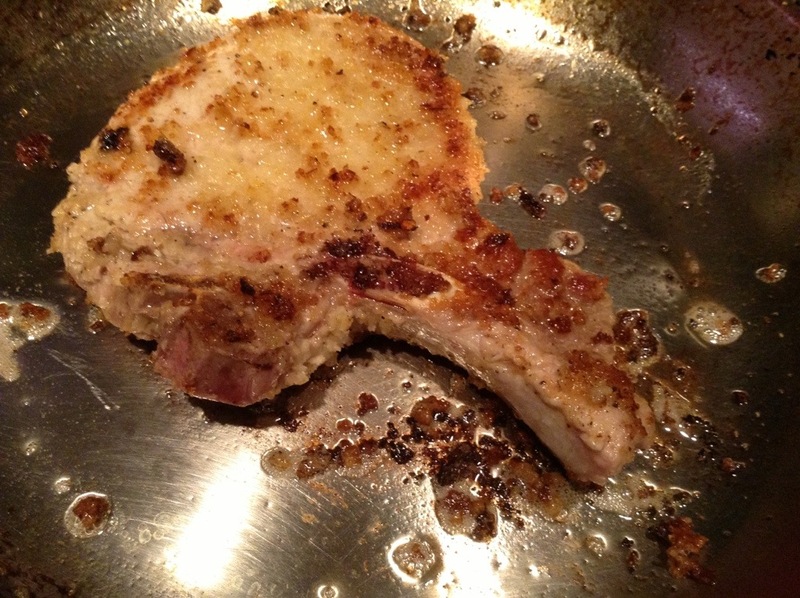 PRESS the pork into a plate of Panko to adhere fully on each side. HEAT a pan and add olive oil to cover the bottom of the pan. When the oil moves freely when tilting the pan, ADD the pork and cook over medium high heat until the first side is evenly browned, 2-4 minutes. TURN and brown the other side but do not over cook. Depending on the heat of your stove and the thickness of the pork, the time needed will vary. Thin pork cooks fairly quickly though so be sure to stay with it and look to press down any raw edges but remove before it becomes tough. 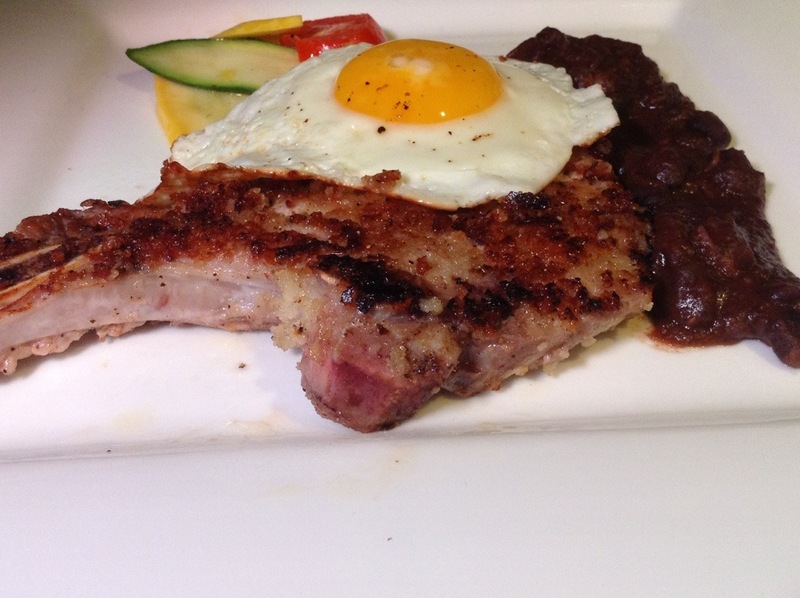 Just as the pork is cooking, you can begin cooking the egg(s). If you have room, you could cook the egg(s) in the same pan. Set the pork aside to a warm spot as the egg finishes cooking. 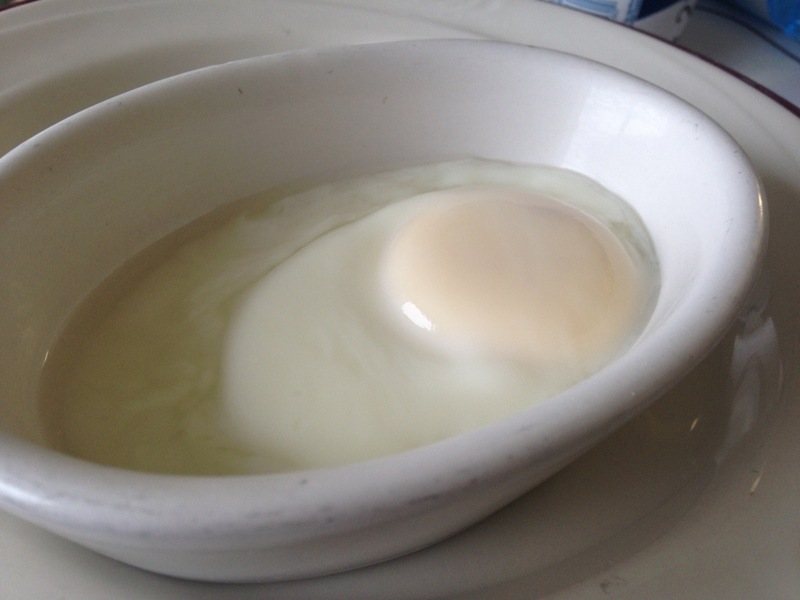 The trick to a sunny egg is to cook the egg white through without turning the egg over. I like my egg a little crispy on the bottom so I do mine over butter but this is an interesting method that I found and will next time give a try. Before I was so rudely interrupted with my unexpected stay at the hotel of medicine (known and respected for their experts and their service, but not so much for their decor), I had made a batch of cannellini beans, flavored with smoked ham shank (right on the tail of making the black beans with ham shank for soup and fajita which shared a cut piece of shank). My plans for this lovely, flavorful, white bean was to casually accompany my lamb rack for dinner and then have it dress up to star in a salad paired smartly with kale (for a trip to the office in my lunch tin). This is something I often plan on doing, but never actually do (make cannellini bean salad to bring for lunching at the office that is), so I was excited by my progress toward this effort and anticipated my upcoming lunch. The first time I tried to cook cannellini beans (having only used canned beans prior), I was preparing them for a dinner I helped co-host with my boss at the time (a wonderful cook, but also comparable to Meryl Streep’s character in “The Devil Wears Prada” – in that intimidatingly stylish sort of way). I spent the better part of a day, and long into the next, going through batch after batch of hard, uncooked, inedible beans. I will spare you the details each effort entailed, how costly (whole prosciutto ends, pink peppercorns, expensive herbs, and expensive beans) or how long. I ended up serving a large platter of Israeli cous cous instead (to accompany her stuffed pork tenderloin) for that particular course (which took all of about 1/2 an hour to prepare). It wasn’t until Tom, lovingly, got me The Zuni Cafe Cookbook (years later) that I was able to produce a velvety bean, while following the able instruction of the late, great Judy Rogers. I have since taken to cooking most beans in my electric pressure cooker (a technique learned from my sister-in-law, Irma), which does shave off some time while producing a lovely result, however, I do still adhere to Judy’s basic rules. I digress though. Upon my release (I mean return) from the medicinal hotel, the beans were still where I left them in the fridge, sealed tight and begging to be used. Being that a liquid diet was still in my cards, I opted to make some of them into a soup (which is how they often end up, but usually accompanied by kale and other goodies in a heartier dish). Knowing that beans, in full form, could present my intestinal problems, I decided to make them into a brothy concoction. Tom is not the largest fan of whipped beans (or any bean other than green, for that matter), so I had already planned something else for his meal and expected to keep this soup for myself. To my surprise though, he gave it a taste and proclaimed it to be good! It is nurtured with bitters and brightened with fresh lime juice. I am rarely without a homemade chicken stock in my freezer, so with the beans already cooked, this comes together very quickly and has a smoky quality from the ham that adds a welcome layer. 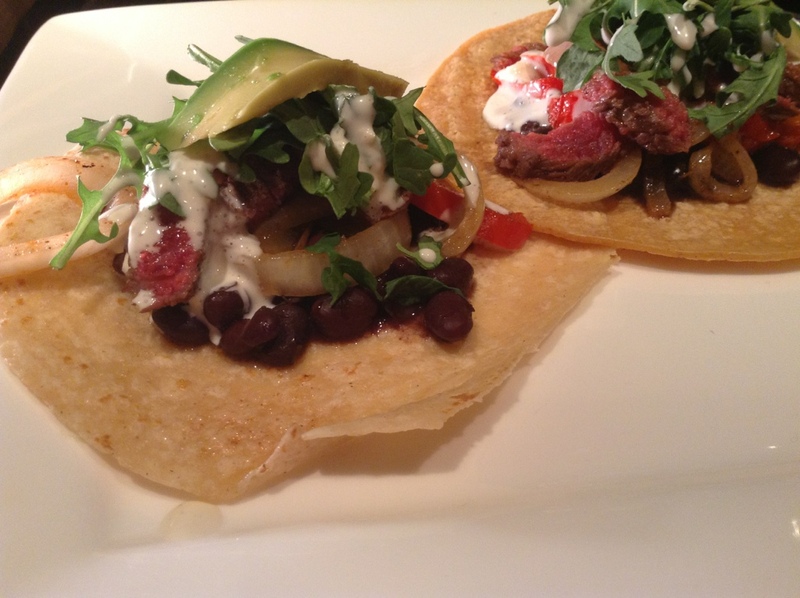 To make this a little hearty, add in the chopped shank meat and serve topped with chopped arugula. Put all the ingredients into the pot of a pressure cooker and cook on high heat for 24 minutes. When the steam valve has released, open the lid and test for doneness. You will want to stir briefly to bring the lower beans to the surface and vice versa. At this point, regardless of texture, go ahead and plop in the smoked ham shank. If the beans need a little more cooking, either continue to simmer or add a few more minutes of high heat pressure cooking. When you are satisfied with the state of your bean’s texture, add salt, approximately 1-2 tsp (test the water for correct amount), juice of half lemon and 1 TB olive oil. Transfer to a bowl with a tight fitting lid. Let these sit overnight to allow the smokiness of the ham shank to permeate the beans. Be sure the beans are at room temperature before putting on the lid. 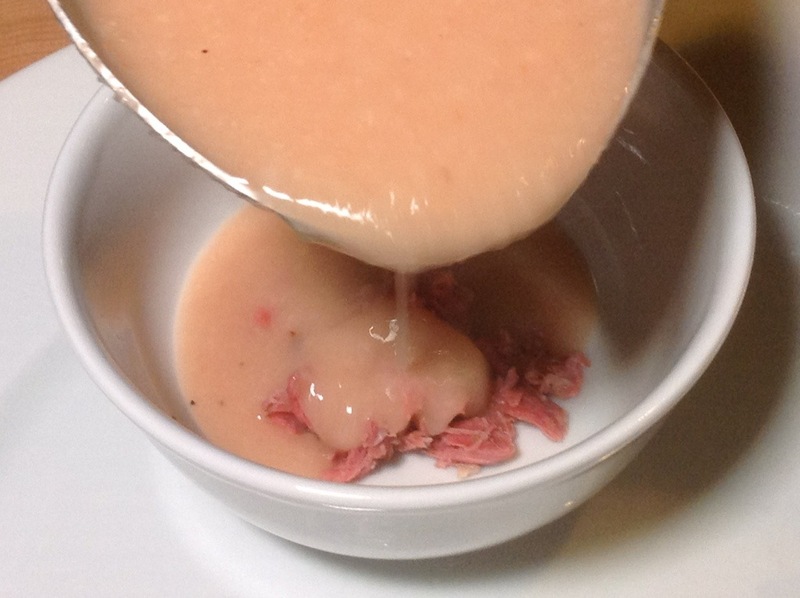 *PUT THE HAM SHANK into a small saucepan and fill it with approximately 4 cups water. Let this simmer for at least one hour or more if you have time. This will make the shank meat nice and tender for the garnish. REMOVE THE MEAT from the bone and chop; set aside. PUREE THE BEANS in a food processor and transfer to a pot. ADD the remaining ingredients to the pot and BRING TO A SIMMER. ADJUST THE SEASONING to your taste. SERVE HOT (ladled over a pile of the chopped shank meat, if using). Squeeze over a wedge of lime and/or drop in more bitters, if you would like. *In lieu of chicken stock, you could add one leek (cleaned and cut in half) to the cooking liquid for the shank and after it has simmered for an hour or two and become fragrant and flavorful, use this liquid for the soup. Since I was quick to the draw (hungry here, in my defense), this did not occur to me until after the fact (when I discovered just how delicious that cooking liquid was; beans are already chalked full of chicken stock and puréed). I will be saving mine for the next batch (I still have beans left, depleted of liquid, rinsed and tucked into the freezer). After reading Ginger’s post (Ginger snaps) from my hospital bed, I became concerned that, in my absence, she actually did SNAP (with that Southern act and all). She is very level-headed most of the time. 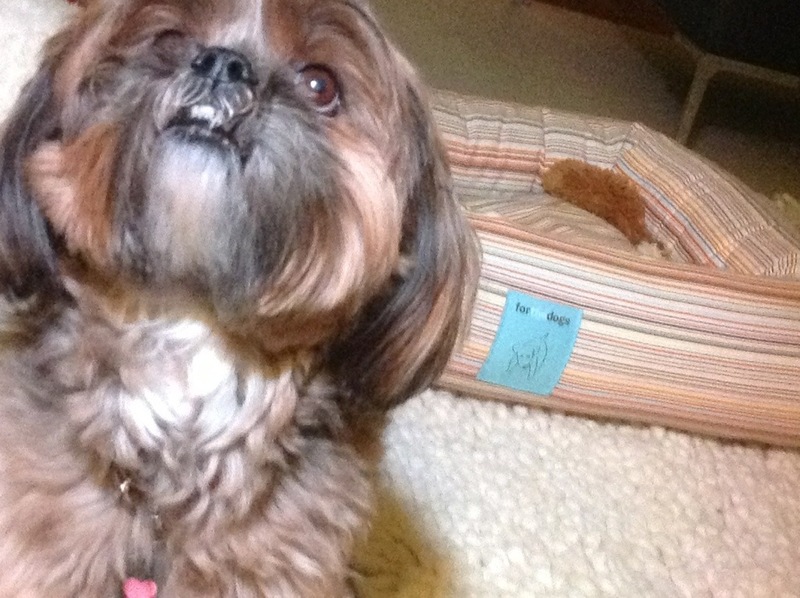 She is more Tomboy than little lady; she snarfs, snarls, growls and barks loudly for food. She does, however, tend to adapt to situations well and can be vey loving and cuddly. She is also very smart and understands all of our motions and emotions. I’m pretty sure she can understand most of our words too. She knows when we are traveling for business versus vacation as we pack, and even knows when she will be joining the trip (or not). She has seen me through hospital stays and recovery days (at the foot of my bed), assisted on airport runs (both coming and going) and has traveled by plane, car, bicycle and boat. However, she has never until this week, seen me leave in the middle of the night, gasping for breath, groaning, almost mindlessly walking from place to place in the house, throwing things into a bag, food into their bowl and whisking them out to pee before barely, crawling out the door. The image I had as I looked back at them stayed with me all through the night. Dog’s are very intuitive and can sense when something is wrong and although I did my best to comfort and assure them that all would be well, I suppose they too could sense that I wasn’t sure myself. We have a good friend that lives across the street who is a physician, so when I first realized there was something more than the stomach flu going on, I sent him a text asking him to call when he awoke (he rises unnaturally early and I figured it could wait until then). When I received no reply and the symptoms became worse, I called, leaving a voicemail realizing how difficult it was to get words from my mouth; by now I was seeking more than comfort from his advice as I heard myself ask for a ride to the hospital. He is often out of town so I assumed that to be the case. I know that I should have called for an ambulance (as Tom was quick to point out when I called him in route) but to me, that just seemed so extreme, and I can be a little stubborn about those kind of things. I stepped out into the cold air and considered walking across the street to knock on his door but somehow, in my head, it seemed more difficult to walk the steps than drive and I felt the urgency to get some relief from my pain. And so, I drove myself to the emergency room early Wednesday morning and, at the time, wasn’t sure that I would return (although that is not what I told Ginger and Buddy). The hospital closest to our house is only a few years old and I had been there just once before to ferry Tom in. Unsure of how to find my way, I called Tom (still in Boston) for directions. He groggily saw me through each step (his sense of direction is superior to mine, even when he’s half asleep). Turns out I did get to have my ambulance ride after all. Thanks to insurance BS, I was transferred to my usual haunt and was admitted to the hospital that morning, unable to have anything by mouth (not even ice). Of course, back at home, in the throws of my pain, I could not imagine ever eating again. However, once the morphine kicked in and the day wore on, I once again began craving food. I started to write but was too tired and weary; I could not find my words. So, I began reading a blog site that I had visited a few times before – Coffeeinthewoodshed. From there I found myself at yellowhouse. I know it seems torturous to read about food when I am unable to eat but, to me, it was therapeutic and comforting. In reading their beautifully constructed posts, I was made aware that my appetite had never left me, which also reminded me of something Dr. McCormick had once, long-ago said (paraphrased), “It’s good you still have an appetite; nothing too bad can be wrong”. I don’t do well without food. I also require water, constantly and ice cold (in a glass). Hand to mouth, hand to mouth, hand to mouth. Having spent the better part of 24 hours unable to eat even a crushed ice cube… well you can imagine how I felt – CRAVING STUFF, HUNGRY, CRAVING STUFF (and it goes on like this from here; you get the picture). When I came home the next evening, Ginger had reverted back to her sweet, loving-self (and lost that “attitude”). Buddy seemed relieved and was unable to leave my side. 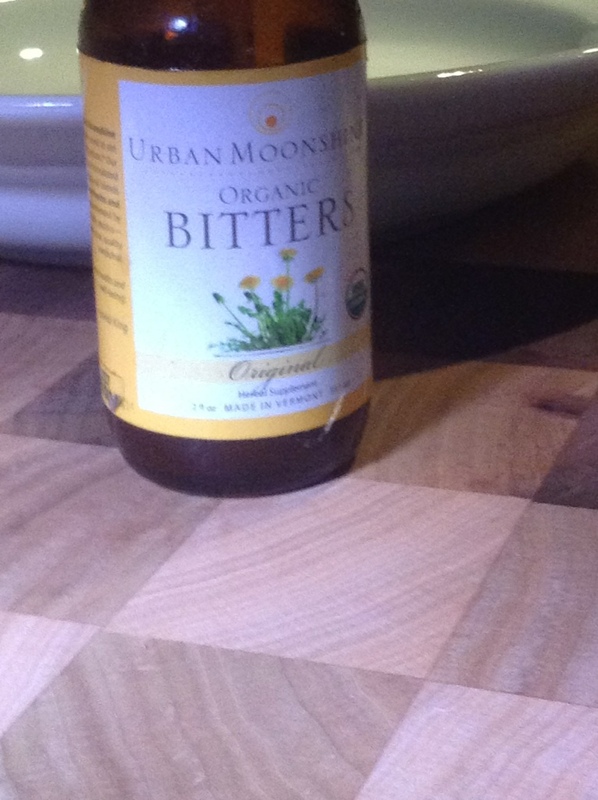 I was still feeling weak, tender and sore but was able to “eat” a liquid diet. Rather than opting for something pre-made, home-cooked was in store. Ginger gladly assisted me in making a humble soup from carrots, ginger (not literally) and leeks. A simple concoction that took little effort to prepare. A simple concoction that helped recover my soul. A simple concoction that will now be part of my repertoire. This soup was my first meal outside of hospital walls. Yes, I did get to order food the morning of my departure (to prove I could hold it down). My first bite was of a hard poached egg. Is there such a thing? Basically it is a hard boiled egg except minus the shell and in the shape off a fried egg. It was delicious none the less! The enormity of eating anything at all; good or bad, is insignificant inside hospital walls because the experiential qualities are incapable of comparison to eating at home. 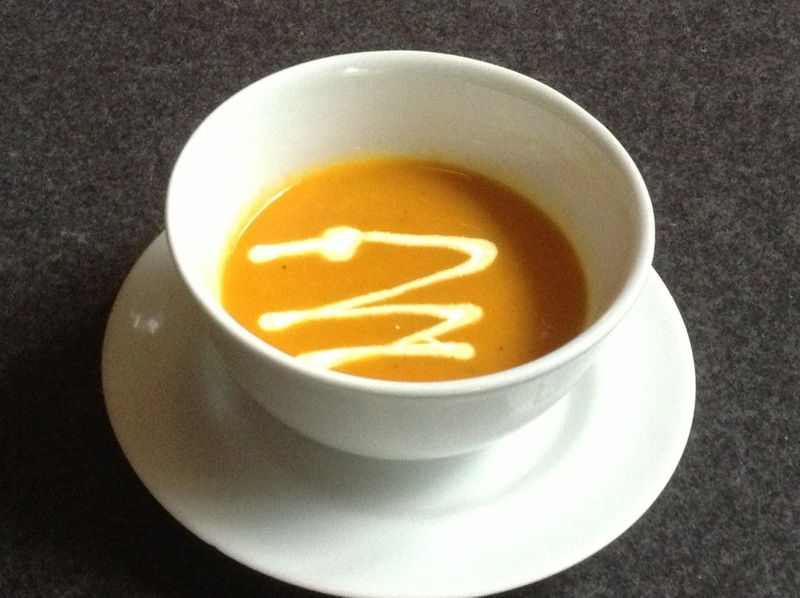 The nature of this soup is very ordinary “carrot ginger soup” but, to me, on this night, it was extraordinary. There is said to be healing qualities in ginger (and Ginger) and in this soup, I have found them. My first taste of food, back home in the retreat of my home was overwhelmingly full of comfort. Music lulling me softly away from the noise of the ward, vivid, bright scents of familiarity and warmth along with my two best friends sharing a meal (they each got the tiniest bowl) was beyond what the doctor could order. Piotr, my neighbor, who had watched Ginger and Buddy while I was away and had been with me through my ordeal (after reading my text), was sent away with some soup too, but I doubt it would have been as therapeutic for him (although, it might have been). I shall remember this soup with great fondness and make it again, when a little recovery is needed. I was then able to sleep through the night. Ginger (both the food and my dog) is restorative, so I opted to allow it’s assertive flavor shine forward in this soup. Leeks balanced the sweetness of the carrot and although it was orange, the flavor of carrot was not dominant; it was more thick than brothy and the zest was just right. Heat a medium stock pot over medium heat, add just enough oil to coat the bottom (less than 1 TB for us) and tilt to coat the pan. Turn the heat to medium-low and add in the leeks and ginger, then the carrots and the thyme. Sauté for 5 minutes or so until the vegetables are beginning to soften but not brown. Add the chicken stock and let simmer until the carrots are quite tender and the aromas have lured you back to the kitchen (It doesn’t take much to lure Ginger to the kitchen, but in this case approximately 45 minutes went by). 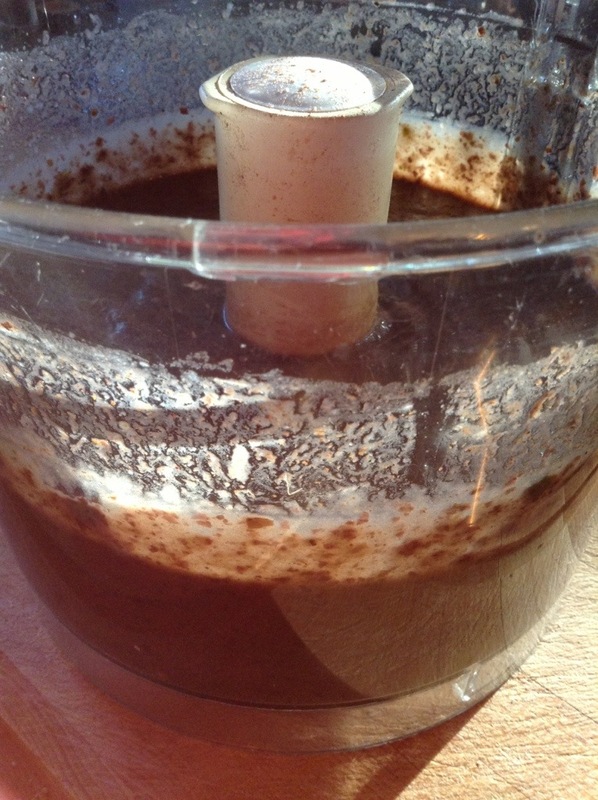 Purée with a handheld blender or put into a food processor. The color should be bright orange and it will be thickish rather than thin; I dare you to NOT instantly put a spoon of it into your mouth right away, or to dip into it with your tongue (talking to you Ginger). Back in the same pot, simmer the soup, allowing the flavors to mingle a bit more. Squeeze in the lemon and flavor with salt. That’s it! Unless you feel the need to do some more fussing, but tonight, we did not. Ginger served mine (ya, right!) 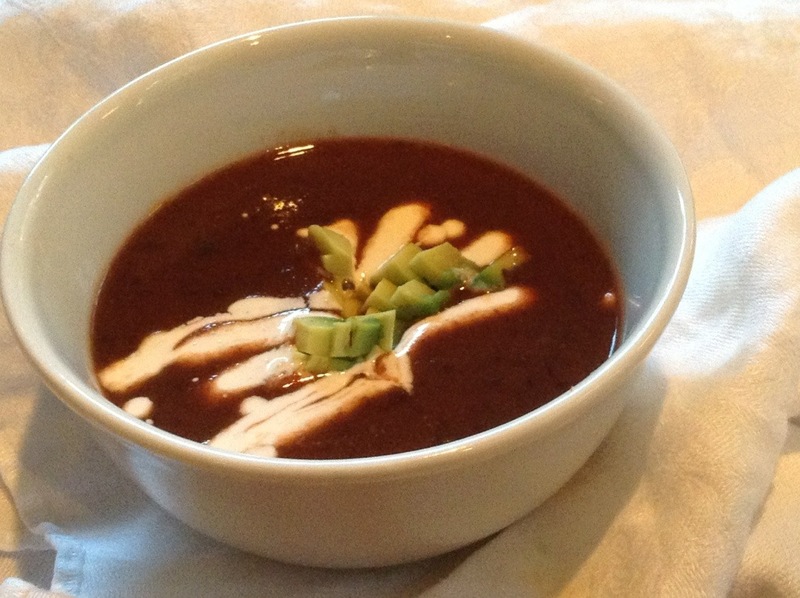 with a squirt of the lime crème made for the black bean soup. 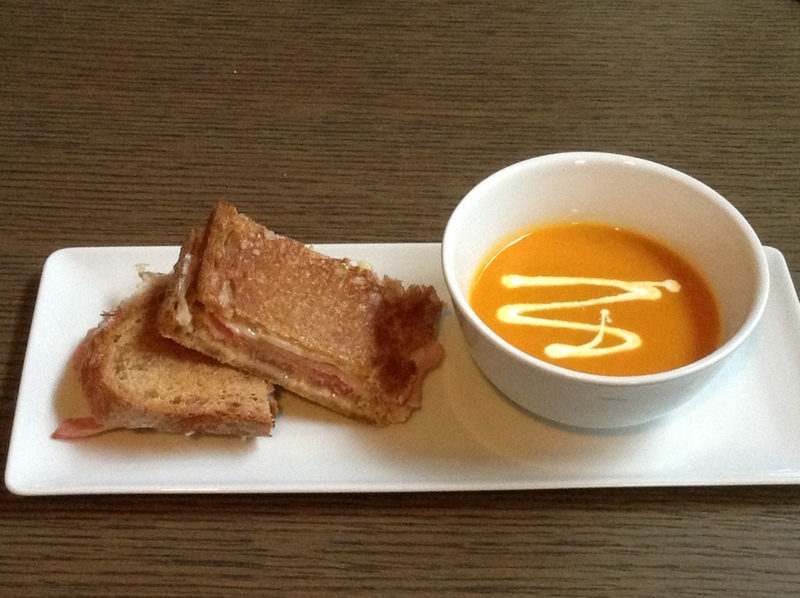 Upon Tom’s return, he enjoyed his with a grilled ham and gruyere sandwich (no airline snacks here)! It’s good to have all of us back under one roof, safe and sound. Roll dough between your impeccably clean paws, forming ~1″ balls. Dip in granulated sugar. Gently flatten. Bake at 350° for 8-9 minutes. Cool on a wire rack until set. Mmm mmm mmm. Sweet. Spicy. Chewy. Sorta like Yours Truly. A (light, late night) Fiesta for One (with Scooby Snacks for Two)! I woke up yesterday morning and realized that I actually did need to wake up; even though it was Saturday. C r a p... I was still sleepy, so comfy, snugly and warm, beneath flannel sheets and stacked in-between pups. While Ginger had my left side, spooned into a crook by my leg, Buddy had the right; he is more mobile during the night and had tucked himself in, straddling forearm and ribs with just enough room for his chin to rest delicately on my wrist. Usually on a Saturday morning, I am abruptly awakened somewhere between 5:00 and 6:00 AM with the weight of a paw or 2 (or 4) on my chest and Ginger’s eyes staring down at me, willing mine to open. As I lay unmoving, soft growls and fake sneezes ensue (from her, not me), increasing in decibel the longer I stay still. This happens only on Saturday and Sunday, mind you. On say, a Monday, my alarm clock is not supplemented, other than with nasal snoring that emits a soft groan as he breathes in (Buddy, not Tom). So on this particular Saturday, I found myself happy to be comfortable and content while the clock blinked that it was seven past ten. I could have stayed on this way for hours, maybe more. I am not usually one to sleep late though, let me be clear. It’s just that it was soooooo comfy, so warm, and the short holiday work week had drug on for what seemed like a full week at least. Tom needed to catch a plane though, which meant getting him to the airport by noon. When you subtracted out the morning coffee, showers and handling Ginger and Buddy’s needs, we were already running behind. I peeled away the pups, shuffled to the kitchen and started the morning brew machine. We are not often apart for this long (he’s gone all week) and especially not starting on the weekend. Saturday and Sunday are for brunching, and lunching, and stories and friends. So after dropping him at the door and pulling away from the curb, I considered the food; what all shall I eat? There are two camps to be in on this thought. Camp number one says lay low; go out to eat, take a break from the kitchen and prepare things that can be eaten directly out of the fridge with little effort and picked on all night. Camp number two says go big; cook things Tom doesn’t usually like, lot’s of them, and then make some more. I thought about this as I drove down the highway back toward our house, and also wondered what things most needed attention on my ever growing, “I’ll take care of that later” list. My closet is still brimming over with unfolded clothes, hangers tightly cramped together with double, even triple, layers of clothes and the floor covered with stray belts, boxes and scarves. My bathroom drawer has become piled back up with extra bottles, jars and tubs of products I felt “I needed to try”. Once again, things fall to the floor (nearly hitting Buddy who insists on laying in the same danger zone as I get ready each day) as I dig through the clutter to unearth my brush, or my deodorant, or the eyeliner which has fallen out of my makeup bag, and into the abyss. I also have correspondence that is long overdue, bills and taxes and filing of months worth of papers. The refrigerator is in a similar state to my bathroom drawer, even though I just cleaned it before Christmas, along with my pantry, which had been tidy and organized but now I can’t close the door without tucking and shoving. I sound like more of a wreck than I really am, but who wants to deal with THAT stuff?! None of that sounded like much fun on such a beautiful, sunny winter day though, so I decided to drive to the car wash and then go to Whole Foods before deciding what to do with the afternoon, and what to do about food. Everyone else, apparently, had had the same thought; the line at the car wash was so long that it was backed up out to the street. I knew that meant a wait greater than the 30 minutes it takes if the line is only 6 deep. I turned around and drove over to the market, emerging 2 hours later with three bags of groceries that I am not sure how or when I will eat. So although camp number one (lay low) had been sounding pretty good, I found myself in camp number three (sometimes you have to make it up as you go). Cooking for two seems like it should be similar to cooking for one. I mean really, it is like adding one more seat (additional guest) to the table; how hard is that? Yet, there are so many people I know, that because they are most often cooking for only themselves, tend not to cook much at all. Sometimes it might be cereal for dinner or a grilled cheese; leftovers from lunch or a frozen entree, perhaps. Pasta is easy, tossed generously with Parmesan, but take-out is easier and probably more often the norm. I secretly like the idea of how easy that would be, so sometimes when Tom goes out of town for a night or two, I am convinced that I will take it easy on myself and relax. Somehow though, it never turns out that way. I always cook big; it’s just what I do. By big I don’t always mean multiple courses and mounds of food. Sometimes cooking big means taking the extra steps that could have been skipped and adding the extra thing that might not have been missed but is appreciated none the less. It means cooking from scratch, cooking full meals, and cooking real food. So as usual, tonight, that’s what I’ll do. I wasn’t very hungry when I got home from the market yesterday but by the time I had put everything away, it was almost 5:00 and I hadn’t had lunch. I began cleaning the fridge, thinking I would figure out what I wanted to eat, but nothing jumped out and gave me a calling. Despite all the groceries I had just put away, I knew I had two really nice Prime beef short ribs that I held off from adding to the beef stew from a few nights before (didn’t need three pounds of meat in the stew), so I decided to cook them but wasn’t sure which way sounded good. By 8:00, I was beginning to get hungry. When I had told Tom I should cook things he didn’t like while he was gone, he said he didn’t like black beans as much as I did. 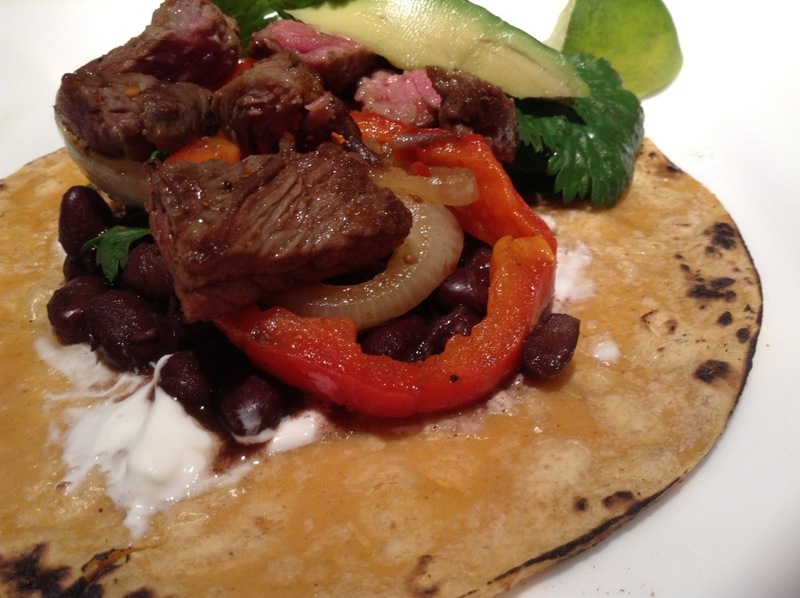 So, remembering this, I began to crave fajitas (I love Mexican food)! I decided to cook a pot of black beans to put on my beef fajitas and use the rest to make a big pot of soup. By the time I sat down to dinner, it was after 10:00 PM. My pals Ginger and Buddy had stayed with me all night and when I sat down to eat, they were vultures, one on each side. Since this was too spicy for pups, I had fixed them a plate of the beef and carrots, diced up quite small (no seasoning) and fed them alongside me. It was just right (I think they’ll agree)! 1 cup beer (Use only 1/2 cup beer and more water or orange juice instead if you prefer not to have it tasting distinctively of beer. I used Bridgeport Kingpin Double Red Ale (as it happened to be in the ‘fridge, but any good, deep ale will do), the whole cup and thought it was great but sometimes a more subtle flavor is desired in which case, drink the rest of it alongside. If you prefer no beer at all, use a chicken or vegetable broth instead). Make the lime crème by blending all of the ingredients together. If you use sour cream, you will make it easier on yourself to blend in a processor. If using crème fraîche, you can probably just whisk it in a bowl. This can be stored in a clean jar or squeeze bottle in the fridge for a week (I only made a small amount because I am by myself and also I don’t have much sour cream and am out of crème fraîche). It will (and should be) tasting of lime which cuts through the spice of the soup nicely. I like it lime intense and thin – adjust thickness to your own taste. To cook the beans, I use a pressure cooker (a trick I learned from my sister-in-law, Irma; saves tons of time and always turns out well). I have the Cuisinart electric pressure cooker that my Mom got for me – love it! Put all of the ingredients, starting from the black beans, through the 1TB olive oil, into the pressure cooker. Cook on high for 22 minutes. When the pressure valve is released, check that the beans feel done. They should be barely firm and give under your tongue. If too hard, simply turn on for another 3-5 minutes or just let simmer instead. Meanwhile, as the beans are cooking, heat the oven to 400 degrees. Put the eggplant, tomatoes and poblano onto a 1/2 sheet pan. Drizzle lightly with olive oil and sprinkle over some sea salt. Put this in the oven for about 15 minutes (just enough time to get me around the block walking with Buddy and Ginger). Peel the skin from the tomatoes (it will slide right off), remove stem and seeds from the poblano and cut the eggplant into large chunks. When the beans are done cooking, add the sea salt, fresh pepper, more lime juice (I usually squeeze in 1/2 a lime) and ham shank (if using). Let this simmer for at least 15 minutes to take in the salt. Adjust seasoning by tasting the liquid; it should not be too salty or bland. The ham shank will add more salt flavor so keep that in mind. I only added it to the beans now so that it would build up some smokiness for the soup. The beans are ready (since I was making fajitas for dinner last night, I set aside approximately one cup using a slotted spoon for this use). Pull out the ham shank and put it into a medium sized pot. 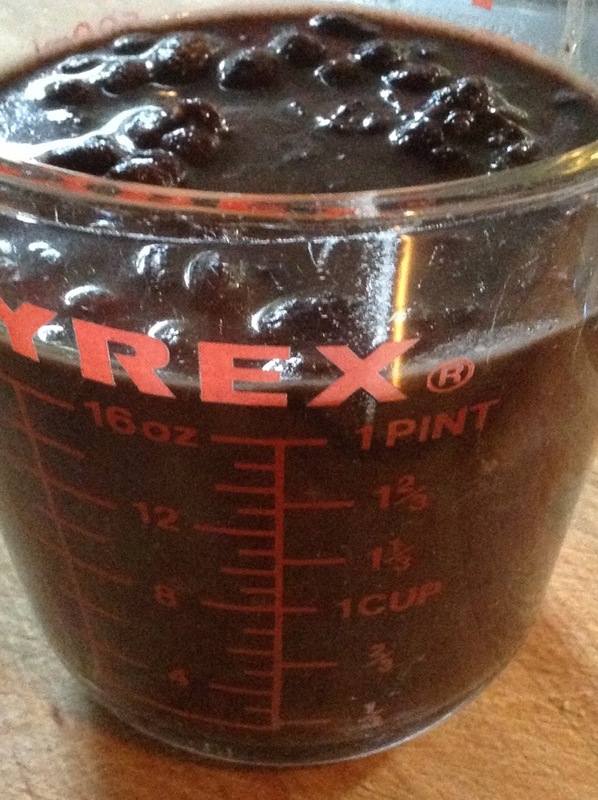 Set aside an additional 2 cups of the beans (liquid and all). This is what the beans look like when I set them aside for adding back to the soup. Then pour the rest into the bowl of a food processor. Add the eggplant, tomatoes and poblano. Process thoroughly. Transfer the purée to the pot with the ham shank. Add the water, orange juice and beer. Let simmer, uncovered, to thicken, stirring often. After an hour, check for seasoning. Add additional cumin (I added 1 TB more), salt, pepper or lime juice to taste. Now at this point, when the flavors seem good and it is still not too thick, I set aside 2 cups to eat, non-chunky style, before adding the reserved beans and chopping in meat (two soups in one – I also did this to enjoy a small cup with dinner without waiting to finish the whole process). This is totally optional though. You could even (as I did), continue the rest of the way the next day – (just do the next step, set aside and let come to room temp before covering and storing in the fridge for the night). 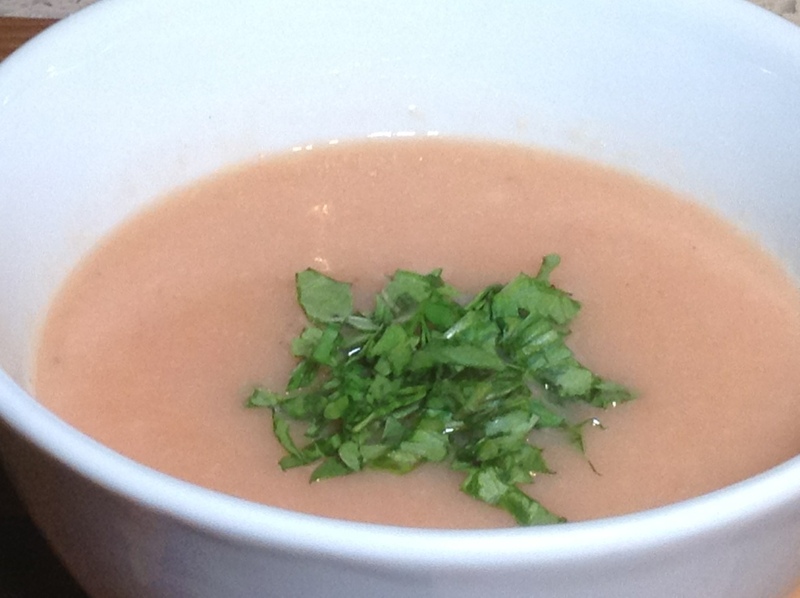 The soup at this stage makes a nice first – light, bright and easy; I had it like this last night. 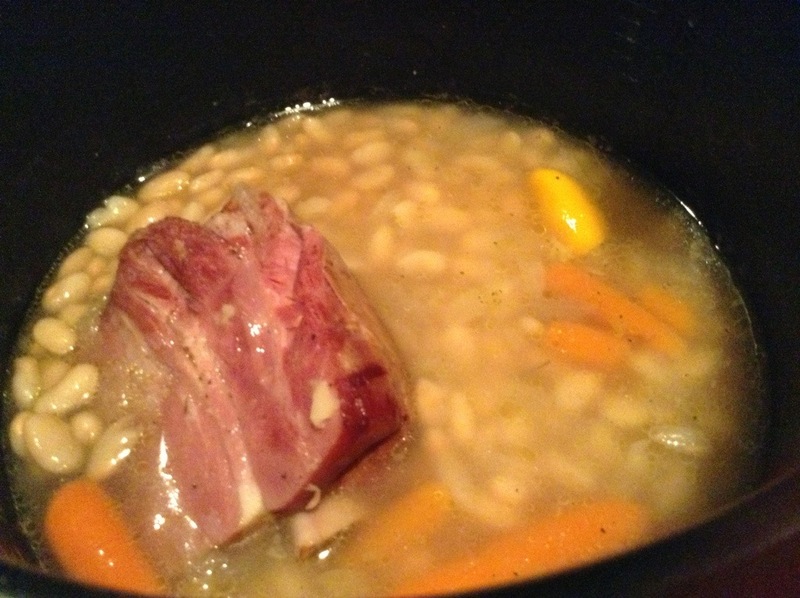 (Hint, this is the next step) – Add the 2 cups of beans that were set aside for the soup. Because you had some of the cooking liquid in it, there will be additional heat but the flavor of the beer will start to retreat. Bring to a simmer, stirring every now and again for as long or as little as you like. I have left mine on low simmer for a few hours now and everything is flavoring nicely (mmm… it smells good – or is that our dinner I smell which is now cooking too?). 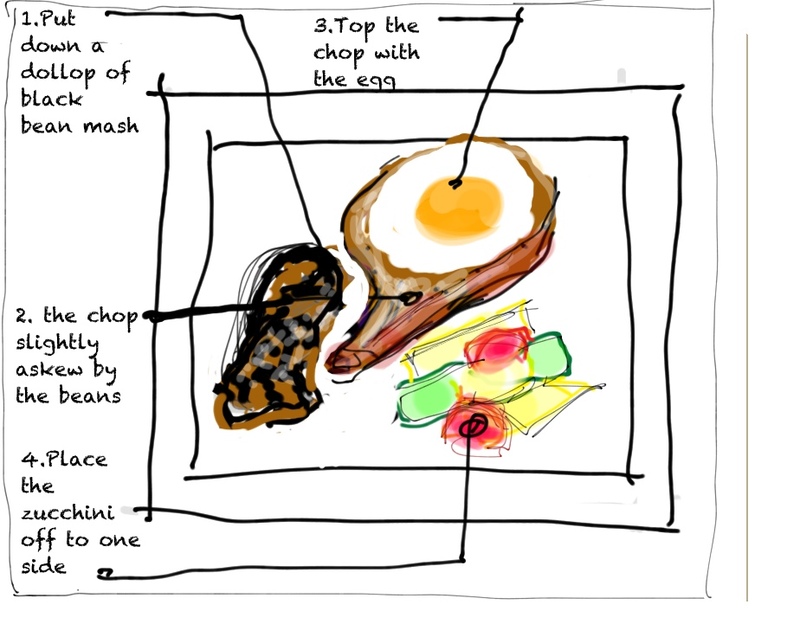 Remove the ham shank, discarding the bone. Shred the meat; chop and add back to the soup (I have been known to serve this in shallow bowls, topped with shaved cabbage and sliced pork tenderloin then garnished with the crème and diced mango… some other time, no beans tonight! 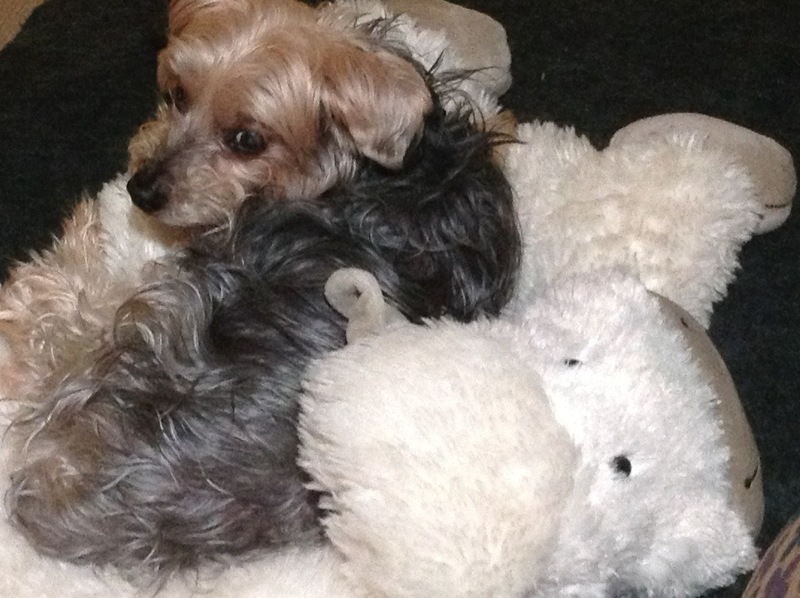 Buddy tucked himself into sheep… wait, what does he smell?